Crows and Ravens are a protected species in areas from Sydney, Newcastle, Wollongong and to west to the Great Divide. A NPWS permit is required before any reduction can be carried out. There are two species of crow and three raven species that occur in Australia and are all similar in appearance with black glossy plumage. 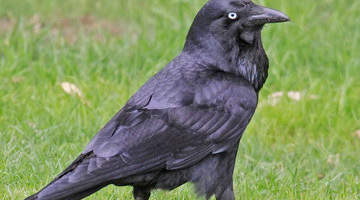 Crows have white bases to the neck feathers, while Ravens have grey colouring at the base of theirs. The Little Raven and the Australian Raven have over lapping distribution in N.S.W. Both species will defend their territories against each other. In rural areas Ravens are despised for the damage they cause to young live stock, even though the clean up job they do on dead animals is beyond calculation. In suburbia however they play the roll of the urban terrorist specializing in golfers they steal their golf balls with glee and fly off amid howls of abuse. Occasionally people are attacked if the bird’s feel their nesting site is being invaded, this can result in an OH&S issue. Damage from Crows and Ravens to golfing greens and sporting fields can be extensive, resulting in expensive repairs.